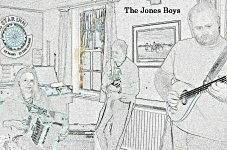 The Jones Boys play traditional tunes and songs from Ireland, England, Scotland, Shetland and Brittany, and occasionally further afield. Sam Sloan is a winner of several All-Britain titles in accordion and melodeon and runner-up several times in the World Championships on melodeon. She plays button accordion, keyboards, whistle, melodeon, fiddle, flute, mouth organ, concertina, guitar and trumpet. Gordon A. Jackson from south-east London plays mandolin, mandocello, bouzouki, cuatro de Puerto Rico, octave mandola and low whistle. Ian Carey was born in south-east London. At the age of 15 he took up the mandolin and has been playing it almost exclusively ever since. His musical experiences range from playing with The George Orloff Balalaika Ensemble in the 70s to a current position with Royal Liberty Morris. In between he has played on and off with Gordon Jackson. In addition to mandolin Ian plays mandriola and tenor mandola and has just acquired a sitar. He is now wondering what to do with it.